Take the Route 23 Route 46 Exit 53. Bear to the left at the exit. Follow the signs for Route 23 South to Route 46. Follow the signs for Route 46 West. Get to the right lane and take the ramp onto Route 46 West. Our office building is the first right driveway off the highway. Make an immediate right and park in the designated visitors spots to the left. Take Exit 54 Minnisink Road. On the exit ramp, bear to the left and turn left onto Minnisink Road. Make your first left onto Vreeland Avenue. Within a few hundred feet, you will see the entry way to Route 80 West on your left. Take Route 80 West and follow the directions above. If you are coming from Route 3 West, stay until it merges with Route 46. Take Route 46 West until you see signs for Route 23 South, which will be to the left. Stay in the left lane. Follow the signs for Route 46 West. You will pass our building on the right. Move to the right most lane of Route 46 West, as if you were going to the Willowbrook Mall. You will see a sign that says Fairfield Road (right after the strip mall). Take this exit and bear right, driving behind the strip mall. Go to the first stop sign. You will now be facing our building. Make a righ turn and proceed back towards Route 46. Our building will be on the left hand side. Follow the road and make a left into the driveway. Park in the designated visitors spots to the left. Take Route 46 East past Willowbrook Mall. You will see signs for Route 46 West. Follow the signs to the Route 46 ramp. You will pass our building on the right. Move to the right most lane, as if you were going to the Willowbrook Mall. You will see a sign that says Fairfield Road (right after the strip mall). Take this exit. Go to the stop sign and make a right. Follow the road to the next stop sign. 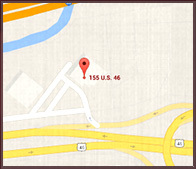 Make a right turn at the stop sign and proceed back towards Route 46. Our building will be on the left hand side. Follow the road and make a left into the driveway. Park in the designated visitors spots to the left. Take Route 23 until it merges with Route 46 West. Follow signs for Route 46 West. Our building will be on the right hand side. Get to the right lane. There will be a sign for Wayne Plaza on your right. Our office building is the first right driveway off the highway. Make an immediate right and park in the designated visitors spots to the left. NOTE: If you miss the first driveway, move to the right most laneon Route 46 West, as if you were going to the Willowbrook Mall. You will see a sign that says Fairfield Road (right after the strip mall). Take this exit. and bear to the right, driving behind the strip mall. At the first stop sign, you will see our building to the right. Make a right and proceed back towards Route 46. Our building will now be on the left hand side. Follow the road and make a left into the driveway. Park in the designated visitors spots to the left.